This guide will take you through creating a conveyancing quote for your clients. Please note: In order to create a conveyancing quote you must firstly have a conveyancing calculator setup for your firm. Read this guide for help creating a conveyancing calculator for your firm. To create a conveyancing quote start by finding the client you wish to quote first (if the client’s details are not on your account then you will need to create a person record for them). 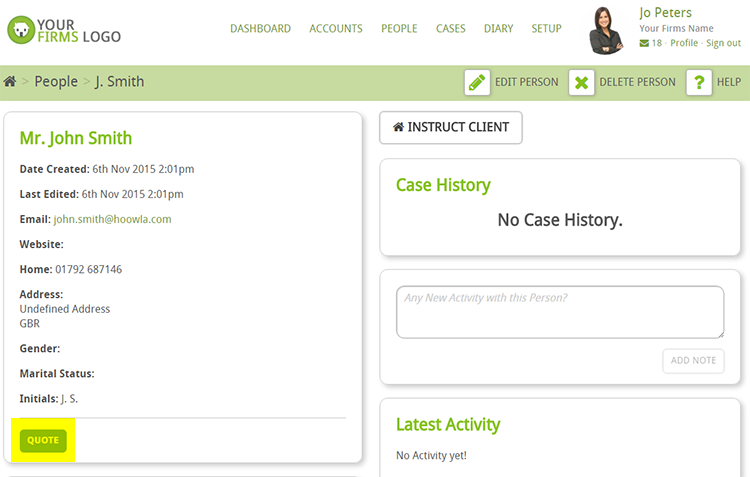 Once you have found your client you can quote them directly from the PEOPLE list by selecting QUOTE. You can also open your clients person record and quote them from there by selecting QUOTE. If you have more than one quote form setup for your firm then you will have the option to select which form to use. Your branches default form will be displayed first. Select the type of quote you will be raising. In this example we will raise a purchase quote. Enter details of the property (as a minimum you must enter the postcode and purchase price). CALCULATE AND REVIEW will create your conveyancing quote but won’t automatically email it. CALCULATE AND SEND will create your conveyancing quote and automatically email it to all of the people involved who have email addresses.